If you've been following along on twitter, you might know that yesterday had a rough beginning. We woke up to NO hot water and spent the second day in row hanging out with our very nice, but loud plumbers. My children were home from school, and I was a bit cranky. I'll be the first to admit it. At around 9am when breakfast didn't make itself as I had hoped it would, and my daughter desperately needed a focus beyond the chaos in the basement, I pulled out my trusty can of organic pumpkin. Time for muffins. They really do have transformative powers, you know. My hungry girl made them with very little help besides opening the can and a little measurement guidance. This recipe can be made with roasted pumpkin or baked yams, but I always keep a couple of cans in the pantry for mornings just like this one. Unassuming. Filled with good things. And so tasty my son finished the last FOUR this morning. You may want to make these over the weekend. Just saying. Makes enough for a tray of muffins plus one loaf of bread. Beat all we ingredients until smooth. Combine all dry ingredients and then add to the wet. Toss in a cup or so of whatever mix in options you happen to have on hand. These hit the spot, and our entire day shifted. Pleasant, cozy, and content are words that come to mind. After lunch we discovered that a little dollop of Nutella on a pumpkin muffin is nothing short of divine. Have a great weekend! Yum! 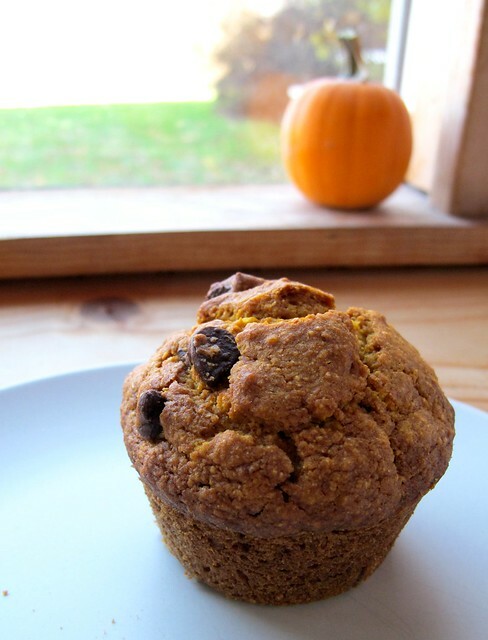 There's nothing like a good pumpkin muffin. Thanks for sharing--I love that the recipe makes several muffins as well as a loaf a bread. I will definitely be giving it a try this weekend as we are expecting snow. Snow! These just got added to my list of things to do today. Thank you. do you used just pumking from a can? I mean I have pumpinks here in Mexico we dont use pumking cans, we can replace with fresh pumking puree? Rosa Maria- I've used both fresh pumpkin puree and cans of pumpkin puree for this recipe. Fresh always tastes... fresher, but in a pinch the cans are helpful. found breakfast for tomorrow ~ thanks for sharing! These look delicious and since they contain pumpkin, I am sure they are. Two questions: do you use the small (14 oz.) cans of pumpkin and is the pan a six or twelve muffin pan? I also love the "two from one recipe". Thanks so much! How long do you bake them? Sorry Maya, my mistake. When I read your recipe, I thought it said "2 cans" but now I see it says "2 cups". Thanks for being nice to "one sandwich short of a picnic" me! I love all your "tried and true" recipes! I know these are going to be great! I love that the recipe makes several muffins as well as a loaf a bread.I will try to this recipe. Wonderful post about pumpkin muffins. These would be a great addition to any Thanksgiving table. Thanks for the recipe! do you think i can just use all purpose flour? or bread flour? i live in the UK and cannot find pastry flour..
thanks in advance :) they look YUMMY! I just made your pumpkin muffins with local syrup and GF flour (mostly Oat) and they are delicious. I typically have to double recipes, so it's nice that it makes so much. Thanks!